Violet and I are on vacation in Atlanta so I brought all of my casually cute mom clothes. 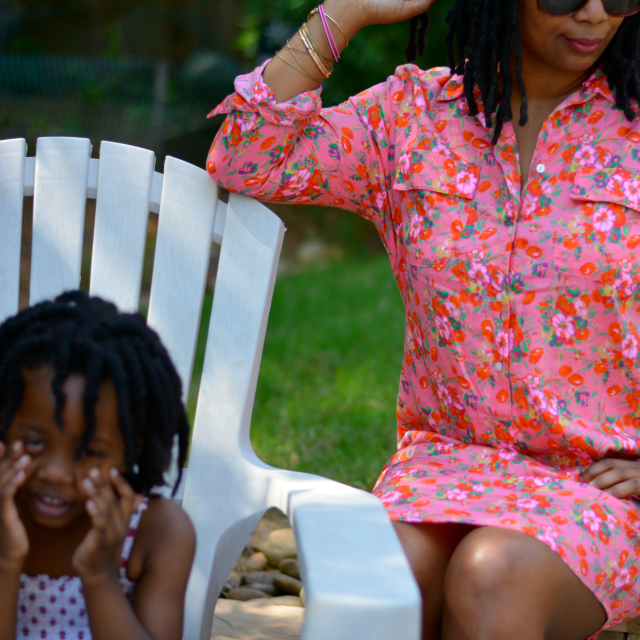 I picked up this floral pink shirtdress before leaving for vacation. Totally random purchase just right for a lounging by the pool kind of day. I'm really starting to like the color pink. I've shunned it a lot for being super sweet and girly but now I embrace it. I like girly things. I like pink. The more the merrier which is why I added pink bracelets and pinky shoes to the rest of the look. 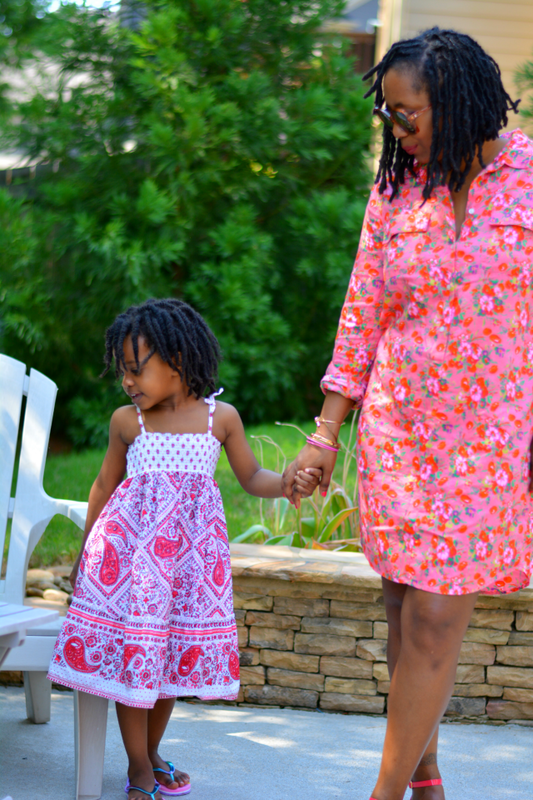 In addition to have a pink explosion, this dress also has a number of vibrant colors that I like and I think they look great together which is why I did the thank you thrift gods happy dance when I found it a couple of days before my trip. It's bright and summery and just perfect for chill. I did bring a belt to define waist but opted not to wear it. Totally unnecessary for a lazy holiday afternoon of eating and drinking. I do think a belt and heels would kick it up a notch. I'll save it for the remix. Just like J. Crew, Gap as a brand works for me most of the time and I would totally buy something like this retail. I'm glad I didn't though. You can't beat that $5 thrift store price! Are you vacation chilling? What are you wearing? Where do you stand on thrift store bathing suits? See our hilarious discussion in the Thriftanista Social Club. When I'm done with vacation chilling, I'll be checking out Atlanta's thrift scene. It just wouldn't be vacation without a little thrifting. Don't you agree? I'm all about the chill summer dresses. I just said earlier that I need to go thrifting just for those items that I can just throw on and go while looking put together. There are some awesome thrift stores here. Ours don't seem to be as cheap as the ones in Chicago though. I love this dress and you can't beat that price. Kudos to you! Oh, I just love that pretty pink on you! It looks so comfortable too. 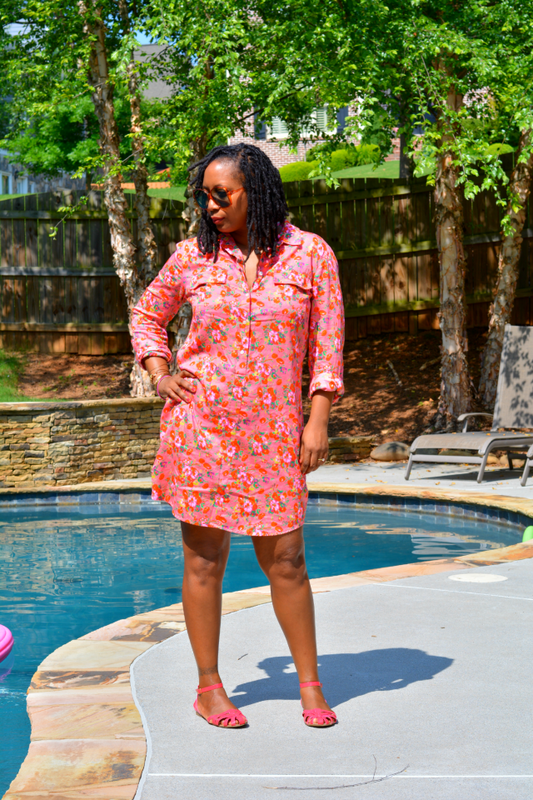 The dress is PERFECT for summer! I was just like you...hatin on pink until recently!! You look fab! 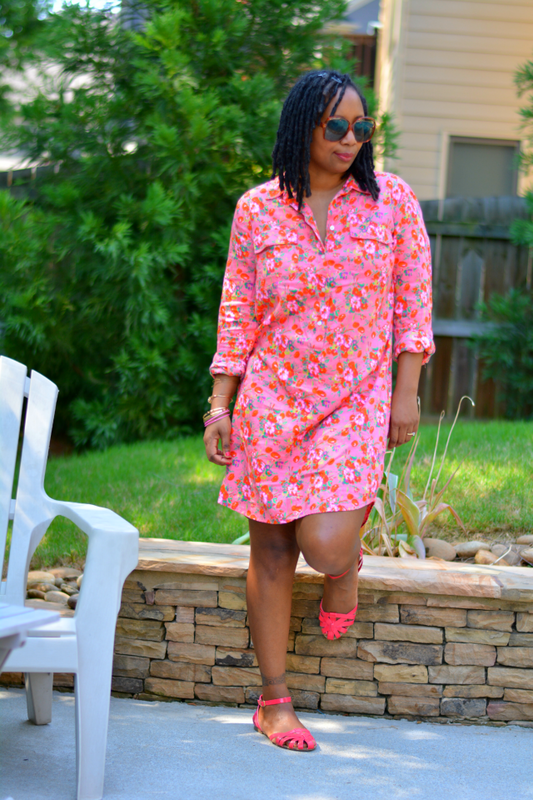 Shirt dresses are perfect for the warmth of the summer and this is a great color for you. I would not thrift a bathing suit - unless it was new with tags. Hope you and Violet are having a nice vacation. I love the color! It's so pretty! Thank you for sharing.